FIRST, WHAT EXACTLY IS MANAGED IT SUPPORT? AND THEN WHAT ARE THE IMPORTANT QUESTIONS TO ASK AN IT COMPANY BEFORE HIRING THEM? Efficient - You can spend more time doing business and less time managing your IT services. Effective - We can provide remote IT support for your employees, including help desk services. Affordable - Our services are affordable enough for small businesses and we never have a contract to sign. 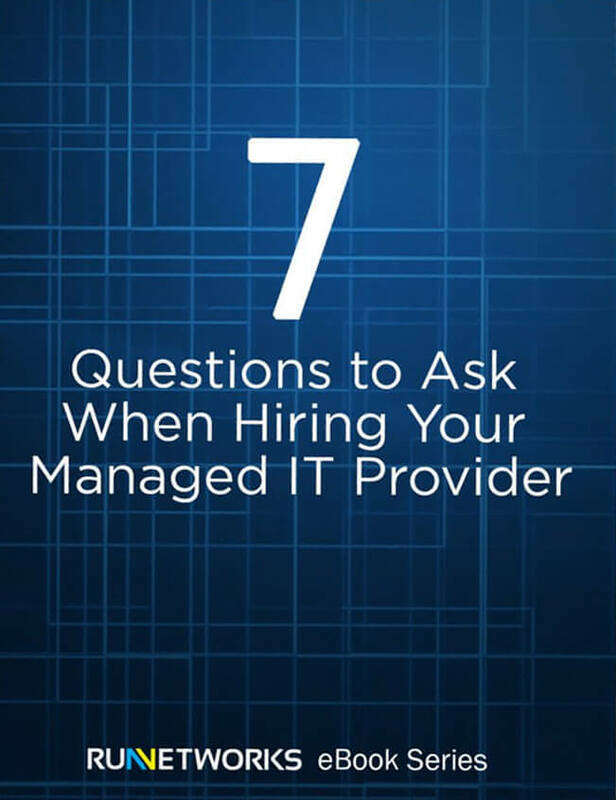 Download the free eBook, "7 Questions To Ask When Hiring Your Managed IT Vendor" to be better prepared for getting the support your business needs. Everything you need for a reliable, fast, secure network for your business. Run Networks wants clients to call immediately upon discovering a PC or network issue. Their dedicated help team will resolve the issue with the client before the problem or question becomes worse. Run Networks provides several backup solutions for their clients. They utilize both dependable local backup and add another layer of backup in an offsite cloud. This cloud backup is secure, and provides for your disaster recovery planning. Different levels of cloud service provide basic file restoration up to cloud virtualization. Run Networks is passionate about information backup! Experienced engineers to design, install, and support your computer network securely. We can give your employees secure remote access, monitor your networks 24/7, provide maintenance, and even act as a help desk for your employees. Run Networks’ Managed IT support packages also include on-site services at the client’s place of business. Most issues can be resolved remotely, but for printer support, staff additions/changes/moves and hardware issues, their team is available to come to you. Experienced engineers to design, install, and support your computer network securely. We can give your employees secure remote access, monitor your networks 24/7 with intrusion detection, provide maintenance, and even act as a help desk for your employees. This service provides overview and detailed reports on all Run Networks’ services to keep you informed of your network’s status. It’s important for you to receive feedback on your network and as your IT partner, Run Networks wants this process to be as clear as possible. Although operating systems and programs seem to update automatically, a personal touch is needed to ensure every PC across your organization is operating efficiently and is truly up-to-date with the current software upgrades. Every PC managed by Run includes virus protection that is installed, upgraded and configured by their technicians. This ensures protection from malicious software, which is provided by guarding against, detecting and reporting viruses. Alerts are set to inform Run Networks of the status of your services, disk space on PCs and much more. To provide full network management, alerts are crucial to allow them to support you completely. Find out how Run Networks can help your business achieve more today!